Is Truecaller Gold Subscription Worth It at Rs 5000 Per Year? If you’ve ever heard of Truecaller, you already would know it’s the ‘go-to’ app for caller identification and spam detection. It solves a major pain point for someone who receives a lot of calls during the day, however, the freemium model does come with its annoyances – especially ads. Truecaller gives you the option to get rid of the ads by picking up an annual Rs. 499 Premium subscription (or in monthly payments), that gives you access to more contact requests, info on who viewed your profile, call recording, and other nifty features. While the paid plan brings enough value, the company believes there’s a niche for another paid plan. This is where Truecaller Premium Gold steps into the picture. 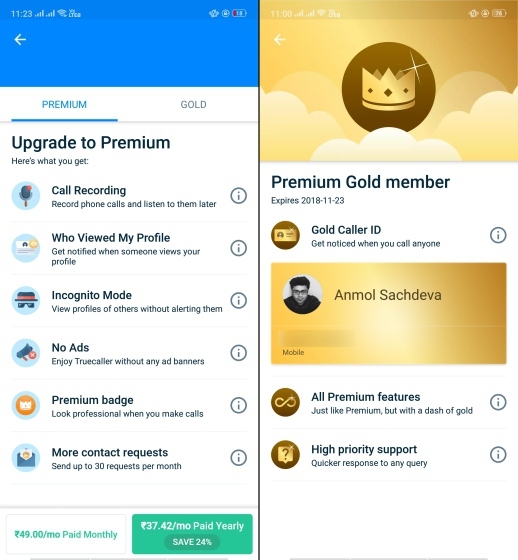 Truecaller wants to push its subscription-based services into overdrive with the new “Premium Gold” to the mix, but take a seat as you’ll have to shell out a whopping Rs. 5,000 annual fee to grab this plan. Premium Gold gives you all existing premium features along with a tinge of gold to help you stand out among other callers. The highlight of this exorbitantly-priced subscription is the gold-colored Caller ID card which replaces the regular blue-colored one, as seen above. How is this beneficial? 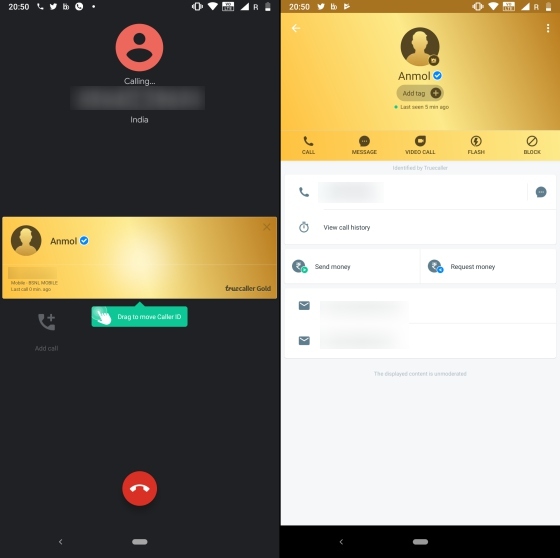 Well, when you make a call to someone who uses Truecaller to identify unknown callers, they will see an eye-grabbing gold Caller ID that is sure to grab attention to your profile. We have been testing out Truecaller’s Premium Gold subscription for the past week and were quite skeptical about the jaw-dropping Rs 5,000 subscription fee, so we reached out to the company to understand who the new plan was truly meant for? Well, Mr. Kim Fai Kok, Director for Communications and Founding Team Member, tells us that the Premium Gold plan is targeted at “top and heavy users of Truecaller, but also users who want to show that their calls are important.“ The company also says they had often received requests for something similar from heavy users and, thus, the Premium Gold subscription has been developed. Mr. Kok may have a point there as some of those who I ringed up did ask me about the gold-colored Caller ID, assuming the calls were important. However, I’m just a regular Truecaller user who didn’t see much merit in this feature. I did enjoy using all the other perks that came bundled with this subscription plan. There were no ads on the pop-up cards during and after the call ended, which did make me a happy boy. You also get call recording, as well as the ability to see who has checked out your profile, both of which worked well. 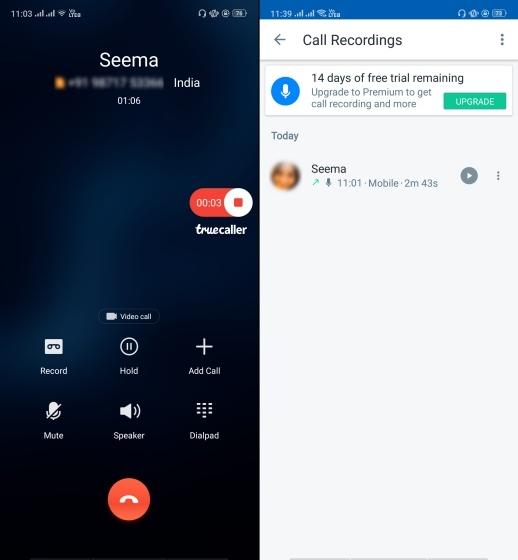 I was using the Realme 2 Pro, running Android 8.1 Oreo, for my test but we switched to Nokia 7 Plus with Android 9 Pie to see if Treucaller’s handy call recording feature works here or not. And well, Google’s restrictions for on-device audio recording appears to be interfering with Truecaller’s plans, who says it is “investigating if it is possible at all” to bring call recording to Android Pie. So, you’ll have to be careful not to dole out the Rs. 5,000 subscription fee to get a Gold Caller ID but miss out on an important feature. You wouldn’t want to regret the decision, later on. Are you someone who’s interested in picking the new Premium Gold subscription? Let us know in the comments down below.